Living on the Earth is back in print, and I have copies of the new 4th edition available! I also have brand new copies of the 30th anniversary edition, and I would be happy to inscribe either book for you. The 4th edition copies are $18.95 and the 30th anniversary copies are marked down to $15. P.O. Box 961, Pahoa HI 96778 USA. Please let me know to whom it will be inscribed and where to send it. I've also got pristine first edition copies of some of my early books (see on the right column of this page), and my 2 CDs, one original folk songs with open tuned guitar, and one Hawaiian songs, mostly in slack key, plus gorgeous, generously sized matted art prints, and organic cotton t-shirts. IF YOU RECEIVE ANY EMAILS THAT APPEAR TO BE FROM PAYPAL, REQUESTING YOU "UPDATE" YOUR INFORMATION ON FILE, DO NOT COMPLY. INSTEAD, FORWARD THE SUSPICIOUS EMAIL TO spoof@paypal.com. EVERY ONE OF THE EMAILS I'VE RECEIVED OF THIS SORT WERE ACTUALLY FROM IDENTITY THIEVES! I'll be selling them right here from this web site. You can email me if you want to be on the list for the first copies. See the column on the left for how to order stuff. Both of my CDs, Music From Living on the Earth and Living in Hawaii Style have been reviewed by Gerald Van Waes, radio producer and webmaster for radioshow "PVHF" (Psyche Van Het Folk), Radio Centraal, Antwerp (Belgium) and writer for Kindamuzik. 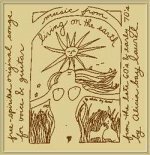 My first CD, Music From Living on the Earth, has been chosen as an All Media Guide Album Pick on www.allmusic.com, and rated 4.5 stars out of a possible 5. In September 2005, both of my CDs, Music From Living on the Earth and Living in Hawaii Style, were released in Japan by EM Records in Osaka. In May 2005 a Korean language edition of Living on the Earth was released by BOBOS, a publisher in Korea. If you'd like to be notified by email when I have a new book published, a new CD released, a performance or tour planned, or have some one-of-a-kind art pieces for sale, please email me and I will add you to my mailing list. The 4th edition of Living on the Earth was published October 14, 2003, by Gibbs Smith Publisher. It's gorgeous, printed on the same cream-colored, textured recycled paper as the Harry Potter books, with chocolate-brown soy based ink. The smiling sun face on the cover is printed on gold foil, the smile debossed (opposite of embossed) into the foil! Also, I am working on a modern sequel to Living on the Earth, titled Still Living on the Earth: Back to the Land in the 21st Century. It will be a compendium of permaculture and sustainability information, plus more recipes, crafts, and other creative, life-affirming ways to spend your time. Whereas I collected the information for Living on the Earth mostly from friends living at Wheeler Ranch commune, this new book contains offerings from friends around the world, happily linked over the 'net. If you have an idea you'd like to share for the text of the book, please email me. 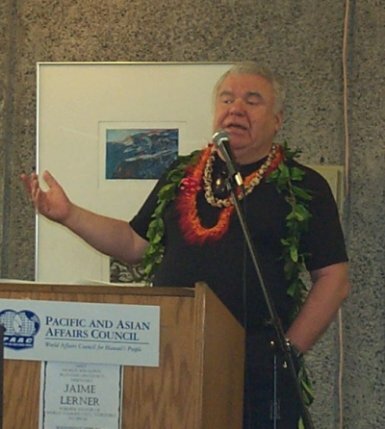 On Wednesday, September 29, 2004, the legendary Jaime Lerner, architect and three times mayor of Curitiba, Brazil, the world's foremost environmentally friendly city, came to lecture at University of Hawaii Hilo as the guest of sociology professor Noelie Rodriguez, her husband Chris Yuen (planning director of Hawaii County), the County of Hawaii, the Pacific and Asian Affairs Council and the student Global Hope Club. I was fortunate enough to attend his talk (about 150 attended, including Mayor Harry Kim and his staff), and thrilled to share a meal afterward with him, Noelie and Chris. On Sunday, March 9, 2003, the tie-dye page from Living on the Earth appeared in the New York Times Magazine, opening the Style section and a fashion article on high-end tie-dye fashions and other current revival trends from the '60's. 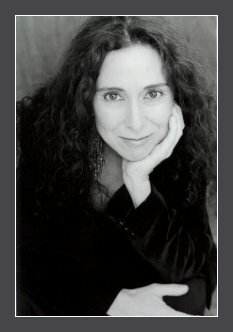 About me, they wrote: "As the Martha Stewart of the hippie age, Alicia Bay Laurel wrote the book on living in do-it-yourself harmony with Mother Nature. Her hand-illustrated 1970 publication, Living on the Earth (a page of which opens this section), offered practical back-to-nature information on everything from mixing your own herbal skin-care products and natural childbirth--'Eat some of the placenta,' Laurel advised--to Zen and the art of moccasin maintenance. Though Laurel has gone on to have many lives, including wedding coordinator and Hawaiian folk singer, Living on the Earth was reissued for the millennium, with more upscale recipes for things like make-your-own soap." It's not the first time I've been compared to Martha Stewart, and no shame there. Whatever else you may say about her, Martha Stewart brought self-reliance, organic gardening, craft-making from recycled stuff, folk art, goat cheese and wabi-sabi to mainstream media. 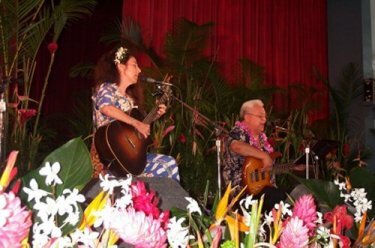 Here I am, performing original songs with Hawaiian bassist-singer Bobo Brown at the Big Island Slack Key Guitar Festival, in July 21, 2002, in Hilo, Hawaii. Bobo's family includes four generations of musicians and dancers famous in Hilo, Hawaii. I was the only woman guitar player who headlined in that festival. I am wearing a "holo-mu'u," a vintage gown circa 1950 that combines the short sleeves of the mu'umu'u with the fitted waistline of the holoku. I made the white orchid hair ornament myself. The print is yellow and red orchids and white clouds on a blue back ground. The stage was decorated with over 2000 tropical flowers! The lineup included Ledward Kaapana, Cyril Pahinui, Dennis Kamakahi, John Keawe, Ozzie Kotani, Ken Emerson with Darlene Ahuna, Manny Varize and his son, Ira, with violinist Tony Selvage, Omi de Jesus, the band Kohala, and Joe and Janice Marquand. Many thanks to Gay Tolar, the festival director, and to the East Hawaii Cultural Center, which has sponsored the event since 1989! 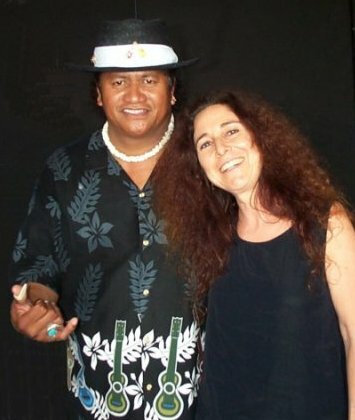 I met the legendary Ledward Ka'apana by taking his slack key guitar workshop at the East Hawaii Cultural Center in Hilo on June 8, 2002. He played two of my songs with me. What an honor! There's a bio of Led on the Dancing Cat Records website. 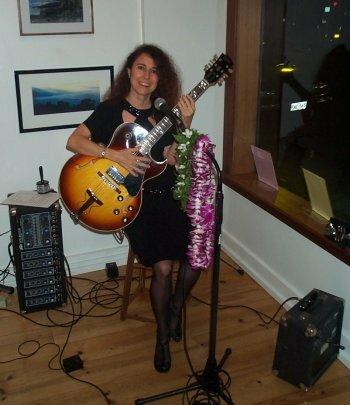 Wonderful fun playing a jazz set on Black and White Night, November 8, 2002, an annual festival in downtown Hilo. My assignment was at the Hawaii Chamber of Commerce. Celebrants in black and white clothing thronged the streets, and musicans blew jazz in the stores, at the bus station, at the East Hawaii Cultural Center. Later, the quintet Jazz Mele swung for the dancers at Cronies Bar. I love this town. Living In Hawaii Style is in the rotation on KAPA radio in Hawaii, as well as other Hawaiian radio stations in Hawaii and on the internet, and on some Hawaiian music radio programs originating in other states! All the lyrics from this CD are now posted on its page! A group of folks interested in celebrating bohemian culture (I am one) are collaborating on a web site. New members are welcome (we have an email discussion group, inwhich we plan what goes on the site.) To see the site, please click on the graphic below. Read an interview with me by John Burnett in the January 2002 Hawaii Island Journal, the Big Island's alternative newspaper, AND an interview by Alan McNarie in the January 23, 2002 Hawaii Tribune-Herald. Click here and scroll to the end of the page. I would be so grateful if you would equip yourself and others with groovy ABL goodies, from the Gallery Section of this site: five fabulous 16"x20" art prints, twoCDs, a poster, Hawaian birthday cards, and an organic cotton T-shirt. Plus the new 4th edition of Living on the Earth! We also have new copies of the 30th anniversary edition of Living On The Earth! P.O. Box 961, Pahoa HI 96778 USA. 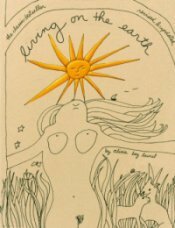 With simple line drawings and handwriting, and a groundbreaking layout, Living On The Earth captured the spirit of a generation and vast audiences (a New York Times bestseller, 350,000 sold in the USA, and is still in print in Japan after nearly 30 years). Widely imitated to this day, Living On The Earth changed the way books are conceived, and influenced countless artists. For more information, scroll to the end of this column. For excerpts and reviews, see the Living On The Earth pages on this site, one each on the 1970-71 editions and 2000-03 editions. Please see the column on the left for information about ordering the 4th edition or the 30th anniversary edition. at $50 per book plus postage and handling. Long out of print, but may return! Everyday life on a commune. We are all one family. A wordless journey into the stars. "No one has to color inside the lines." Sorry these are out of print, but I am interested in republishing them! "An oldie, hard to find, and worth its weight in emeralds"
Lots of Alicia's color and ink drawings, with ceremonies and poems for life's passages.by Joe Pintauro, who has since gone on to become a reknown playwright. at $50 per copy plus postage and handling. Liberation News Service. Other illustrators include Peter Gould and Doug Parker. copies available at $35 each plus postage and handling by emailing Alicia directly. 16 original songs written at the time of the first edition of Living On The Earth. Sweet vocals over open-tuned guitar picking. 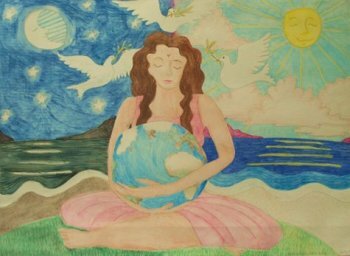 Songs about nature, gardening and spirituality. Available for $15 plus postage and handling by emailing me directly! Hawaiian recording artists, including one slack key and vocal song composed and performed by Alicia titled Festival of Lights. It's the world's first Hawaiian Hannukah song (fo' real.) Alicia created the song at the request of Rick and Donna Keefer of Seawest Studios, who produced this CD and recorded her first two CDs. The other artists on the CD include members of the Hawaiian bands Ka'u, Pa'ani Pila, and Pu'uwai, and slack key guitarists Ken Emerson and Bryan Kessler. The Gibbs Smith Fourth Edition of Living on the Earth is updated with current information on sustainable technology and preservation of the environment and recipes for natural foods basics unknown to Alicia in 1969, but all of the original drawings and most of the original text remain intact. 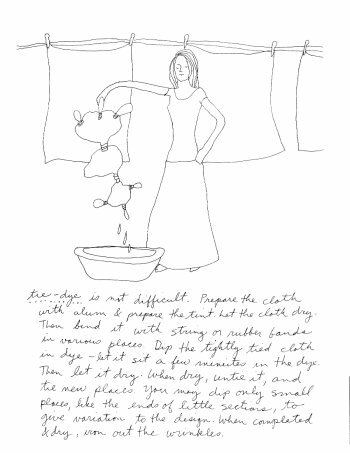 The large format paperback is entirely written in Alicia's cursive script and illustrated on every page with her line drawings. Alicia's innovative illustration and book design styles were enthusiastically emulated in dozens of books including Anne Kent Rush's The Massage Book and Mollie Katzen's The Moosewood Cookbook. Her graphic design influence is still in evidence today, best demonstrated in the works of SARK (Succulent Wild Woman, Eat Mangos Naked), gift designer Laurel Burch, and the Shoebox Line of Hallmark Cards.